get back on your feet, on the field, and in the game. IMS Consultants offers you a full range of products and services designed to fit your specific needs. 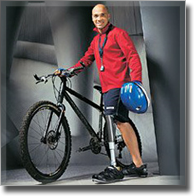 Anything you require concerning orthotics, prosthetics and pedorthics can be found with IMS! Paul M. Pollichino, C.O, P.
MS Consultants Wound-Care Specialist and Director founded the practice in 1986. He served for six years as Director of Orthotics & Prosthetics for Nesconset Sports, Inc, preceded by 16 years as the President of P.M.P. Orthotic & Prosthetic Specialists. Before that, Paul was the Managing Director of New York Surgical & Health Care Centers. Currently, Paul is a member of the following organizations: American Board for Certification, American Academy of O & P, American Orthotic & Prosthetic Association and the Board for Orthotic Certification.